“Captain’s log stardate 48992.3, we have been doing test runs in the Gamma Quadrant to determine whether or not we can reach vessels which are under attack, quickly. Major Kira has requested the job of sitting in a runabout and then waiting for us to arrive. Initial test results are grim,” Sisko looked up from his log to the Federation bridge of the war vessel Defiant. Jadzia Dax was at the helm, Odo was brooding at a security station, and O’Brien was down in engineering, probably finding some new way of increasing the power on the warp engines. “What type of metal?” asked Sisko. “Change course to intercept warp six.” Sisko had been correct to fear the worst, in fact it seemed that his first officer was truly dead. “But,” protested Jadzia. Federation scientists had recently accepted that warp engines did more harm than good and a speed limit had been imposed on Star Fleet’s ships. Sometimes however these speed limits had to be broken, now was one such time. “Do it,” Sisko needed to know, to find out what had happened. He needed to know whether Bajor would have to send him a new first officer, which would not be pleasant. It had not been long since he had last asked for replacement crew. “We are within visual range of the metal,” Said Dax calmly. “On screen.” The main viewer blinked into life and the scene of destruction greeted him. The bridge visibly relaxed and Sisko leapt into action, “prepare to de cloak, full stop, ready an away team, Doctor Bashir,” Sisko tapped his comm badge. Damn thought Sisko I need a new plan. “Bashir here,” chirped Julian over the comm system. “Aye sir,” Dax tapped her console with amazing speed and agility. “I have Major Kira,” shouted Julian down the comm. “Jadzia, raise shields, warp 5, get us out of here.” Dax pressed the buttons on her helm and the Defiant streaked away into the stars. In the Defiant’s sick bay Doctor Julian Bashir helped fix Major Kira’s cuts and bruises, that was all that was left as he had repaired most of the major damage already. The door whirred open and an angry Sisko stormed into the room ready for a head on confrontation with his first officer. “Major Kira, what the hell did you think you were doing?” Sisko was fuming this was the third runabout he had lost and he did not fancy explaining this to Star Fleet. “I’m am not shouting,” shouted Sisko, “I’m just expressing myself, LOUDLY.” Sisko did not normally stay angry long but just now he was, his first officer had nearly been killed, so he had to be angry. “If you think you’re well enough, maybe you can join us on the bridge,” Sisko stormed out of the room and headed for the bridge. “What’s got him so annoyed?” asked Kira. “Cassidy Yates wont be back for another month,” informed Bashir. “Can you tell what it is?” asked Sisko suddenly disturbed. “Are you sure?” barked Sisko. Dax worked at the helm. The image on the main viewer changed from streaking stars to a dense but still star field. In the distance two Jem’Hadar warships could be seen approaching very rapidly. “Their speed is increasing, their weapons powering. Captain, they are on an intercept course for us,” warned Kira. “Isn’t this enough trouble?” shouted Kira. “Major,” Sisko turned his command seat and gave Kira a warning look. Major Kira had already locked onto the lead ship she had been wise to be cautious. “Firing now,” she struck the button with the same ferocity that the Defiant fired with. POOM, POOM, POOM. The shots were fired off with such force and speed. The small war vessel was already turning to give off another round of shots when both Jem’Hadar ships fired. The Defiant’s shields flared and sizzled. Blue sparks erupted on the bridge, “shields down to seventy two percent,” shouted Jadzia over the noise of the battle. A workstation on the side of the bridge exploded into a flash of sparks and then fire. Damage control teams rushed onto the bridge to try and halt the damage that was being inflicted on Sisko’s ship. The main viewer shifted position as the Defiant turned for another pass. Rapid-fire shots, more comparable to bolts, came flying out of the war like canons on the side of the ship. The lead ship caught the force of the impact and was jolted back. Another volley and the ship spun back out of control and then exploded. The second ship continued the attack seemingly undeterred by the destruction of their fellow ship. Enemy phaser fire struck the Defiant. “Shields have collapsed,” announced Kira with an edge of panic in her voice. “Hull breach deck 8,” bellowed Odo over the noise of the battle. “Mr O’Brien, I need those shields back up now,” ordered Sisko. “I’m doing the best I can,” came the Irish voiced reply. “Aye sir,” chirped both the women. Dax piloted the ship to just underneath the enemy ship while Kira locked the phasers. “NOW!” yelled Sisko. Both officers followed the orders exactly and as the Defiant zoomed away from the battle site the Jem’Hadar ship found itself with no engines to follow them with. “Cancel red alert,” said Sisko as soon as he knew that they were out of danger, “resume cloaked status.” With that the Captain of the Defiant stood up and walked off of his own bridge. “Good, that’s a pleasant change,” replied Sisko. “Lets just say that DS9’s shields are a dream compared to this.” Well it is an improvement, thought Sisko; at least they had some shields. “On my way, Sisko out.” Sisko rose to his feet, if he could get it right maybe he could prove himself to his crew again, “coming Major?” Major Kira turned and followed Sisko to the nearest turbo lift. “What!” Sisko stood up out of his chair stunned. “Analysis,” requested Sisko when he had recovered. The briefing room was neither fancy nor was it huge; it was in fact small and functional. All of the senior officers sat around the rectangular table in the centre of the room. Odo sat beside O’Brien who was worried, Odo did not like the idea of an alien homing beacon sending out a strange message and he assumed that O’Brien felt more uncomfortable since he came from that planet. Odo had not known what it was like to feel for a home until nearly one year ago. Benjamin Sisko had been kidnapped by the Jem’Hadar, genetically engineered servants of the Dominion. They had discovered that the Dominion were controlled by the Founders and when they had reached the Founders home planet Odo had discovered something even more sinister – his people were the Founders. They created the Dominion to impose order on the Gamma Quadrant but Odo realised that he did not want any of their ways, not even their Great Link, which had been tempting at first. Odo was for justice, not order and that was where the Founders and Odo clashed. Now Odo was once again alone, a changeling – a name his people had adopted – alone in this world of the solids. Odo thought again and then realised he was not alone he had his friends. Kira was his closest friend; O’Brien was close too but in a different way. Where as Kira was a friend who Odo shared his problems with, O’Brien was a friend because he helped Odo, he did not hinder him in his investigations, in fact he sometimes helped him, unofficially of course. Garak, the last Cardassian left aboard DS9, was a strange friend. In a recent investigation Garak had almost tried to kill Odo but in the end they had both worked together to save each other. Garak had never wanted to kill Odo and at that a strange friendship had formed. “We have two options. We can either bring it aboard or we can leave it,” Sisko spoke calmly and with distinct authority. “What about an antiproton scan,” suggested O’Brien. “It’ll take two hours to set it up and during that time we are totally vulnerable from Jem’Hadar attacks,” stated Dax. “We could head back to the station and rig something up there,” persisted O’Brien. “We can’t do an antiproton scan,” Kira finalised the situation. The debate stopped and all eyes turned to Odo. “Could it be Dominion technology?” asked Odo. Well that was that, thought Odo, he had well and truly been told. The debate raged on, O’Brien wanted to study this thing while Sisko wanted it brought aboard. Dax wanted to study it but she realised that they could not wait. Kira was not a member of Star Fleet and as a result she could not understand why these people that she worked with had to stop and study everything that they came across. Odo, however, bet that even Kira was intrigued by this mystery beacon – who was not? After another five minutes Sisko used rank to get his way. Odo understood why he did it, it was to push things along, if he had not done it then they would be stuck here for the next hour trying to debate it out and that was no joke, this crew had a habit of arguing a lot when things did not suit them. It was decided that the beacon would be brought aboard and that Dax, their science officer, would study it. The angular beacon floated in space. It was not powered so it did not move instead it was still, silent and foreboding. Sisko took one last look at the main viewer just to make sure that he had done the right thing. He thought about it then agreed with himself that this was the only way to get answers. “Dax, lower shields and prepare to tractor the beacon.” Sisko shifted uncomfortably in his chair, why was this beacon directing people to earth, who had made it. “Shields have been lowered and the probe has been tractored. Where do you want it?” asked Dax. “Put it in cargo bay two.” The Defiant had only two cargo bays; since it was a war ship it had been decided on designing that it would only need two cargo bays. Cargo bay two was the sensible choice since it had a particularly effective bio filter. When goods were brought into the cargo bay they passed through a bio filter that was supposed to kill all harmful bacteria on the cargo. Cargo bay two was the only cargo bay to have a bio filter probably an oversight thought Sisko. “The beacon is aboard,” said Dax. “Yes sir,” said Kira as she rose from the weapons console to walk across to the helm. “I always am,” Dax flashed a smile back at Sisko as she step off of the bridge. “Major, resume course to the wormhole, warp five.” Major Kira pressed a few buttons on the helm and the stationary star field on the main viewer changed to streaking stars. Dax stood outside cargo bay two stepping forward she entered. The cargo bay was large but sparse. It was decorated in the usual grey that was all over the ship. As Dax walked to the beacon she found herself shivering, not from cold but from fear. Her footsteps echoed round the cargo bay and were rebounded back at her. Then she stopped in front of the beacon and the room was quiet, she was alone. The beacon was huge. The top point almost reached the full height of the cargo bay but it was also thin which meant that there was plenty room to walk around it. The beacon had a square centre and out of this stretched two long points. Dax stepped forward to examine the lower point; there were strange markings on it. “Computer,” called Dax, “scan markings and try and find a match.” Dax spoke with a cold, methodical voice. She had lost all fear for this was business and also curiosity had gotten the better of her. “Search will take approximately 2.3 hours,” replied the computer. “Unable to scan beacon interior,” reported the computer. Dax walked around the beacon wondering what lay beneath that cover. “Computer, scan the beacon’s interior using a decadon scan.” A decadon scan was not used everyday; it was normally used to scan behind extremely thick material. Asteroid miners used it to determine the stability of an asteroid that they were about to drill. Dax was using it just to penetrate the beacon’s surface. Well, thought Dax, if I cannot find out what is inside then I will just have to find out what is on the outside. The beacon was fairly normal, there were strange markings on it and as Dax walked round she found a marking unlike any of the others. Upon closer examination it was revealed to be an outline of a creature. It looked like… Dax was interrupted by the gentle swish of the door – it was Odo. “Can I help you Constable?” asked Dax politely. “I’m just curious about the origins of this beacon,” replied Odo distractedly. “Have you tried opening it?” asked Odo. “I would like to assess the amount of danger this beacon poses before I open it,” replied Dax coldly. Dax knew that Odo was just being friendly but he was distracting her. She was slightly glad of the company but she was willing to persevere with this puzzle. “Keep me informed. I would like to be ready for any danger,” ordered Odo, then he turned and left the room. Dax hoped that she had not insulted Odo in any way. She knew that he was an expert at reading every little nuance in Dax’s movements, in everyone’s movements. Dax walked round the beacon to the outline. Moving her hand forward she touched it and found that there was a slight indent. In her mind she searched for the name of the creature. Scorpion, an Earth creature, she remembered it from a time when Curzon had gone fishing with Sisko. They had spent the night in a tent and when Sisko had unrolled his sleeping bag he had found a scorpion. That had been when Jennifer was alive; Dax remembered that she had come along also. Thinking some more Dax realised that this was not a scorpion but something very similar, the main difference was there was no stinger tail. Dax reached forward, this was the only symbol like it and she had had an idea, and placed her hand on the symbol. It moved in slightly to align itself with the depths of the other symbols. Dax heard a slight noise and glancing up she noticed that a small hatch on the square section had opened. Standing up to take a look she realised that it was dark. Dax walked over to a small cupboard and opened it, there was a torch inside it, and she lifted it out and turned it on. The hatch was lit up to reveal a mass of wiring, Dax recognised some of it to be part of the transmitter, which transmitted the homing signal. Then something in the distance caught her eye, she thought she saw movement. Dax looked again but this time she looked closer, she saw nothing – it had been a trick of the light. Dax pressed her comm badge to inform Sisko of this development. “Aye sir,” replied Kira as she rose from her seat. “Federation technology?” asked Sisko surprised. Sisko was interrupted by Dax, her voice betrayed an urgent sense of terror, “Benjamin, there’s something…” Dax screamed, the pain in the scream was intense, and then it stopped. “What do you mean not working?” asked Kira with a hint of anxiety in her voice. “I hope Dax pulls through.” Kira touched Sisko’s arm gently. “So do I Major,” with that Sisko left the cargo bay. Dax lay prone on a bio bed in the Defiant’s sickbay. Julian was running a tricorder over her body trying to find a cause for what had happened. The steady trilling of the machine was the only noise that could be heard. Julian looked at the readings he was receiving. “This can’t be,” he muttered to himself. Julian rushed across to a medical console and began tapping in commands, he needed answers and he needed them fast. Jadzia was one of his closest friends and he was not prepared to let her die on him. At that the doors to sickbay whirred open. Julian looked up, his concentration broken. “Doctor, I want a report,” Sisko spoke with authority but there was an air of concern there as well. “Captain, I can’t tell you anymore. As far as I can tell it’s as though the Dax symbiont had been removed from her body.” A look of utter confusion passed over Julian’s face as he tapped more commands into the medical console. “There must be some way to save her. Something we can do to make it better.” Sisko looked across at the prone for of Jadzia. There lay his friend and his mentor and the only reason Sisko knew she was still alive was the steady beep of the bio bed. “I can’t tell you what’s wrong with her until we get back to the station. I can only hope to keep her alive for the time being,” there was a definite waver in Julian’s voice. As the Defiant sped through space towards the wormhole its sensors failed to pick up a weak signal of Starfleet origin. A vessel, the U.S.S. P’Jem, was signalling a distress call as it travelled to the wormhole on autopilot. Empty corridors and empty rooms lit by darkened lights and failing power. Echoes of a crew that had once inhabited this vessel were present. In sickbay lay two men on bio beds the rhythms of the beeps showing that they were weak but steady. 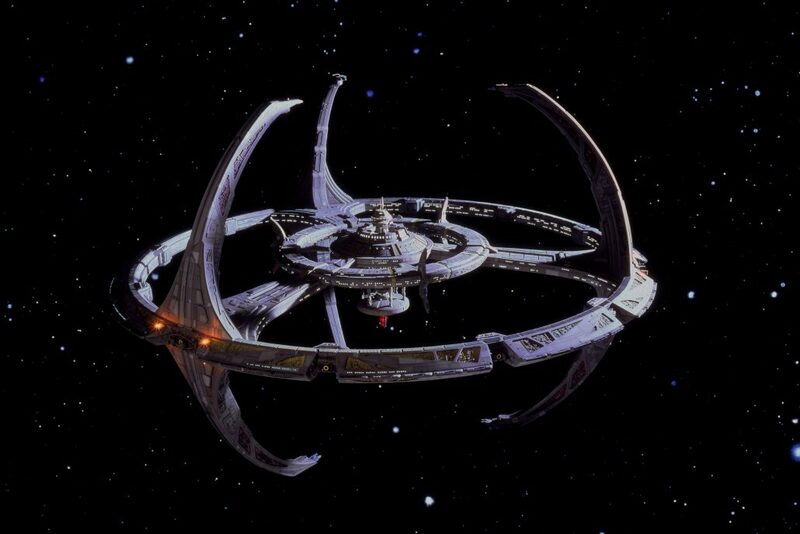 And not too far away lay the salvation of the wormhole and Deep Space Nine – if only they could get there. The Defiant had docked only 5 minutes ago but already Julian was in sickbay with Jadzia trying to figure out what had happened to her. Kira was walking through the promenade trying to figure it all out. She hoped that a visit to the Bajoran temple would allow her some time to reflect and meditate on the situation. Suddenly Kira bumped into somebody and as she was brought back to reality she realised she was staring right into someone’s brain. “Oh, oh, I’m sorry, Captain Boday.” Kira was trying to desperately look anywhere but at Body’s transparent skull but for some reason her eyes were glued to it. Boday stood there in shock and then eventually seemed to come to a conclusion as to what eh should do. Kira almost imagined that she saw the thought processes firing through his head. Kira knew that she had to pull her eyes away from the skull, look elsewhere; it was only polite not to stare. Kira watched the Gallamite captain head off in the direction of the infirmary and breathed a sigh of relief. Jadzia had tried to explain what she saw in Boday but Kira could not get past the transparent skull. While she liked men who were straightforward and open there was just something a little too open about the Gallamite captain – and he spoke too much. “I have my sources and they are to be protected.” The Ferengi grinned secretively. “I’ve said no Quark.” Boday was about to resume his heading towards the infirmary when Quark interrupted him. Boday was not happy about Quark chasing after him. The Ferengi had been trying to make a deal with him for several months now especially since a lot of trade deals with the Gamma Quadrant had dried up due to the Dominion. Boday continued on his way to the infirmary.